ICI New Products | IEC60320 C-13 & C-14 Cords | Schuko CEE 7 GFCI Outlets | Universal Adaptors Plug Adapters | IEC 60320 Plug Adapters & IEC 60320 C-13, C-14, C-19, C-20 Adaptor | Schuko Plug & Connector Brochure | IP66 Covers & Boxes | Brazil Power Cords, Plugs & Outlets Bulletin | IEC 60320 C-13, C-14, C-15 Plugs, Connecters & Adaptors | IEC60320 C-13 to C-14 Splitter Y Cords | NEMA 5-15P to C-13 Y Splitter Cords | Multi-Configuration Power Outlet Strip | Universal Power Strip & Multi-Configuration Power Outlet | SJT, SJTO, UL & CSA Cordage | SOOW UL & CSA Cordage | International Configurations, Inc.
Power Cords for use in North American and International Applications. 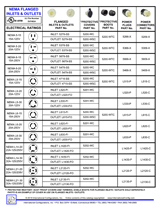 IEC 60320, IEC 60309, Hospital Grade and Country Specific Cord Sets are Available for use in Industrial, Marine, Data Centers, Power Distribution Units, Construction Sites and Military / Federal Government Applications. European Extra Heavy Duty Schuko CEE 7/7 Power Plugs & Power Connectors. Impact Resistant IP20, IP44 16 Amp 250 Volt Rated. Designed for Industrial, Marine, Military, Extension Cords, Data Center, Chemical and Food Processing Facilities, Power Distribution Units, Construction Sites, Concert, Theatre & Sporting Venues. 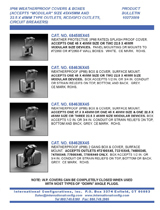 North American NEMA Flanged Inlets and Outlets for use in the United States, Canada, and Mexico. Panel mount inlets and outlets come in a wide-range of Amp and Volt specific NEMA configurations. Devices can be affixed with Weatherproof and Dustproof covers to protect the front of the device; and boots (terminal shields) to protect the back of the device. Worldwide Applications. Available with 10mA and 30mA Circuit Breakers. 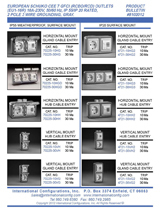 Our GFCI and RCD Devices are available for Flush Mount, Surface Mount, Panel Mount, Din Rail Mount and In-Line Mount Applications. For Weatherproof Applications We Offer IP55 Rated GFCI Receptacle Kits with Flip-Lid Covers. European Schuko CEE 7 GFCI - RCBO - RCD Outlets. Single & Duplex European GFCI Protected Power Outlets. Indoor IP20, IP44 & Outdoor Weatherproof IP55 Rated. 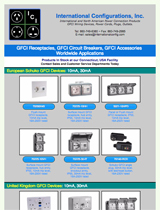 Visit our Modular Electrical Components and GFCI Product Website. Brazil Power Cords, Power Plugs, Connectors, Power Outlets & Receptacles. NBR 14136 10 Amp 250 Volt, 16-20 Amp 250 Volt Single and Duplex Power Outlets. Surface or Rack Mounted Power Strips. 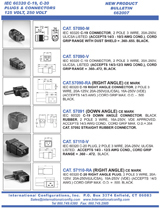 Panel Mount Power Receptacles. Wireable Plugs and Connectors. 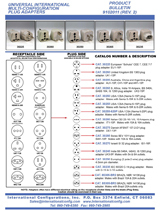 For Complete Brazil Range see Country - Brazil Electrical Product Guide. IP66 Weatherproof Covers & Boxes. Designed for Use with our Modular Range. 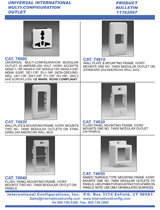 View Entire Range in a Brochure Visit Modular Power Outlet Electrical Brochure and Guide or link directly here to our Modular Electrical Components Product Website. Universal International Multi-Configuration Power Outlets. Our Multi-Configuration Power Oultets are designed to accept plugs from numerous diffrent Coutnries. These power outlets are available in single, duplex or panel mount. Power Outlets are 20 Amp 250 Volt rated. 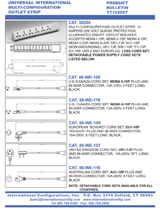 Universal International Multi-Configuration Outlet Strips. Our 5 outlet & 6 outlet power strips are designed to accept plugs from numerous diffrent Coutnries. These power strips are manufactured to accept detachable power supply cords. Power strips have 13 Amp 250 Volt rating with surge suppression and an illuminated on / off circuit breaker. 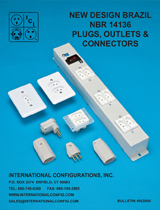 Universal International Multi-Configuration Plug Adapters. Adapters Accept Plugs from Several Diffrent Countries and then Mates to a Country Specific Power Receptacle. 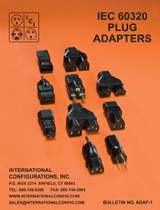 Entire List of International Plug Adaptors can be Viewed at this Adaptor Guide Link. IEC 60320 Plug Adapters. IEC60320 C-14 to C-13 Splitter Adapters, C-14 to NEMA 5-15 Adapters, C-14 to C-5 Adapters, C-14 to C-7 Adapters, C-20 to C-13 Adapters, NEMA 5-15 to C-13 Adapters, NEMA 5-15 to C-19 Adapter, NEMA 6-15 to C-19 Adapter, C-14 to C-19 Power Cords & C-20 to C-13 Power Cords. IEC 60320 C-13, C-14 Jumper Cords & Power Supply Cord Sets. 10 Amp, 13 Amp & 15 Amp 110-250 Volt Rated SJTO and H05VV-F Approved Cordage. IEC 60320 C-13 to C-14 Y Splitter Power Cords UL, CSA & European Approved. 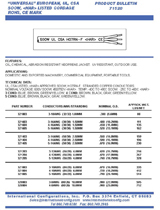 IEC 60320 Y-Splitter Cords carry International Universal Approvals and are UL / CSA Listed. IEC 60320 Splitter Cords Manufactured in 18/3 AWG and 14/3 AWG for up to a 15 Amp Rating. 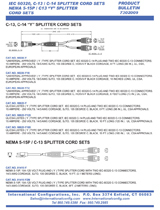 IEC 60320 C-13 to C-14 & NEMA 5-15 to C-13 Splitter Cord Sets are suitable for use in Data Centers, Computer Rooms, Server Rooms and more. IEC 60320 C-13 Part Number 57055-M & C-15 Part Number 57050-M are Heavy Duty Wireable Connectors. These Connectors Accept Cable up to 12/3 AWG. 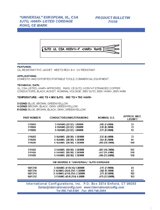 Additional Products on this Brochure are Left-Angle IEC 60320 C-13 / C-15 Connector Part Number 57075 & Left-Angle IEC 60320 C-14 Plug Part Number 57045. 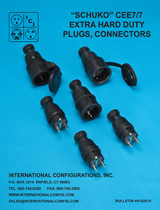 IEC 60320 C-19 Part Number 57090-M or Part Number 57090-V & C-20 Part Number 57110-V are Heavy Duty Wireable Plugs & Connectors. These Devices Accept Cable up to 14/3AWG & 12/3 AWG. 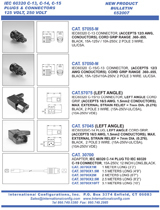 Additional Products on this Brochure are Right-Angle IEC 60320 C-19 Connector Part Number 57090-RA & Right-Angle IEC 60320 C-20 Plug Part Number 57110-RA. Universal SJTO, SJT, H05VV-F, UL, CSA, HAR, RoHS, REACH Cordage. Produced with oil resistant PVC jacket, stranded copper conductors, black jacket, SJTO, SJT - 300V / H05VV-F - 300V/500V / AWM - 600V rated nominal voltage. UV resistant outer jacket. Follow this link to view our Universal SJTO - H05VV-F - HAR Cordage. 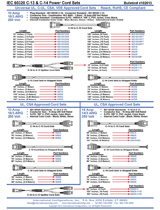 Universal SOOW, H07RN-F, UL, CSA, HAR, CE Mark, RoHS, REACH Cordage. Produced with oil, chemical, abrasion resistant neoprene jacket, stranded copper conductors, black jacket, SOOW - 600V / H07RN-F - 450/750V rated nominal voltage. UV resistant outer jacket. Follow this link to view our Universal SOOW - H07RN-F - HAR Cordage.